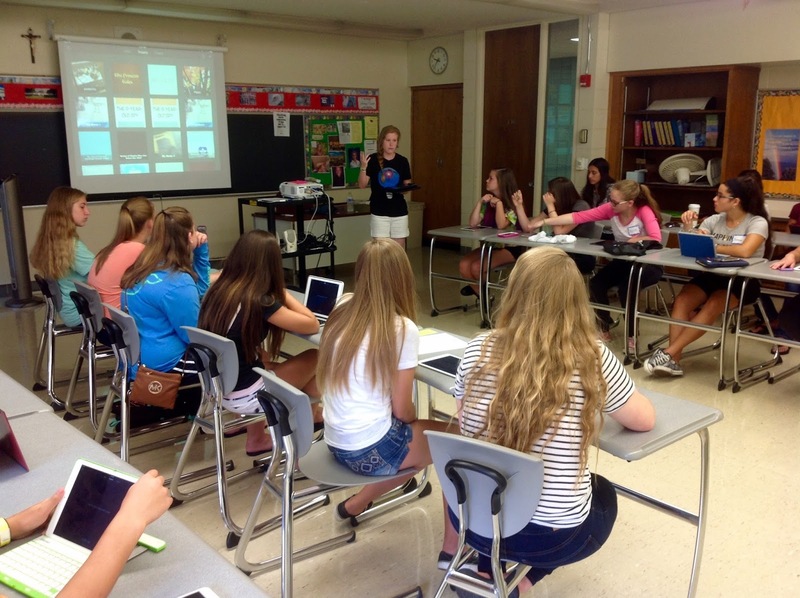 Three years ago Mercy adopted the iPad as its 1:1 device for the class of 2016. Shortly afterwards we formed a club of ninth grade iPad enthusiasts who named themselves the “iWizards“. Those ninth graders set upon an ambitious project: They would conduct the two and a half hour tech orientation for the next group of ninth graders. While the iWizards now pursue additional projects, they still produce the new student tech orientation before school officially starts. This year every Mercy student will have an iPad, and some of the iWizards who originally formed the club are now seniors. Learning with them over the past three years has been a fabulous experience. Last Friday (August 14), twenty-four current iWizards provided an orientation for the new students four separate sessions. This actually meant that eight teams of iWizards independently taught sessions with a teacher of their choosing in the room for support. The process of choosing the subjects, creating the curriculum and presenting the material is a great experience for these young women. They acquire presentation and technical skills but also they gain self-confidence and leadership skills. They hold each other accountable and each year we have been delighted to find that none of the iWizards bail out on the project over the summer. P.S. New students may apply to become iWizards in October.